TIAA-CREF (Teachers Insurance and Annuity Association-College Retirement Equities Fund) is the leading retirement provider for academic, research, medical and cultural fields. Late 2014, they began a total rebrand which included dropping the "CREF" from their name. 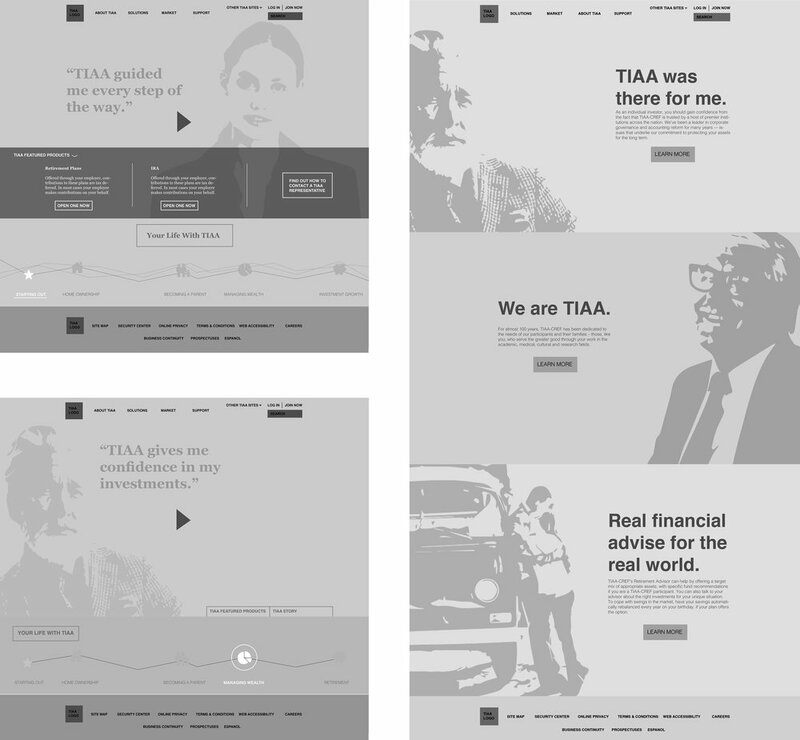 TIAA approached frog to designthe new website as well as lead the new identity effort. The rebranded identity and site launched at the beginning of 2016, refreshing the 100 year old institution founded by Andrew Carnegie. TIAA.org site here. frog's engagement with TIAA was about a year, from research to launch. My involvement was during phase 1 - immersion and concept definition. During this phase, our team consisted of about 7, with members rolling on and off as needed, including a creative director, researcher, visual designer, multiple design technologists and interaction designers. My role began with immersion, conducting a trendscrape of competitor sites as well as a user needs assessment of the current site. A heuristic analysis of the TIAA-CREF site through a user lens helped us understand what the current site was doing well and not so well at. The old TIAA-CREF site had multiple issues particularly with navigation . It was the result of numerous internal siloed marketing teams pushing product and campaigns with a lack of rational a information architecture strategy. Mapping the site gave me an understanding of the multitude of products and pages as well as how the structure. Blocking out the components within each page type helped me create an inventory of content as well as the purpose and value of each page. Numerous issues were discovered such as an inconsistency of patterns, interactions, page layout, hierarchy, typography, iconography and content. Through understanding each page through content, layout and where it lived within the IA, I was able to identify specific page types and create categories to systematically organized them. Each page on the site fell into one of these page type architypes. A content inventory was created through identifying the components on every page type. Components were then mapped to each section of pages understanding how pages were structured. Our team proposed three unique Experience Models for the overarching flow of the new site. "Curator" is an options-led model in which the user is offered content tailored to them, but they ultimately select what they are looking for. "Cinema" is a lean back approach that leads with storytelling from real TIAA customers with the intent the viewer connects emotionally. "Conversation" puts the user in the driver seat through conversational prompts to filter the ideal solutions for them.